Nigeria as a whole. She represents the unflagging voice of an emergent de-patriarchalised and development-minded female gender in Nigeria. Also, she articulates pivotal arguments that touch on both the seemingly ordinary and the profound in the creative encodings and significations in her writing. Importantly, she showcases the predominate temper of contemporary Nigerian literature, with idiosyncratic sifts, twists and deflections, thus bringing to bear upon us literature that has a newness of spirit and which distinguishes it from previously established works. These and many more are issues that have engaged the scholarly contributors to this pioneer reader on her fiction. 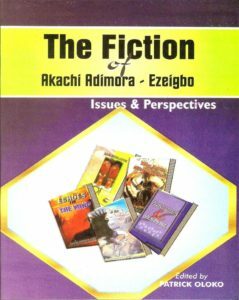 The essays in this book constitute a compendium of original research and thinking and each of them throws open new vistas for further research into the writing of Adimora-Ezeigbo.